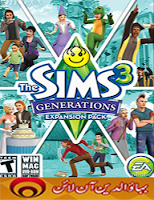 The Sims 3 Generations is the fourth expansion pack for the hit single-player simulation game The Sims 3. The Sims 3: Generations offers fun new features and objects to play with, but on the whole, it doesn't make much of an impression. The Sims games have traditionally received two types of add-ons: "stuff" packs that give fans new items like decor and apparel, and full expansions that add brand new gameplay elements. The Sims 3: Generations is an awkward middle child, granting you more than just hairstyles and new chairs but none of the inventiveness found in previous expansions like World Adventures and Ambitions. This addition is a pleasant extension of what The Sims 3 already does--not a game changer--and series addicts will undoubtedly enjoy how well Generations captures the essence of life's individual milestones. Children get tree houses and playground equipment; teens learn to drive and go to prom; adults have midlife crises; and grumpy oldsters shoo away annoying kids with their canes. These enhancements are subtly integrated into the main game, but they don't have the overall impact of previous expansions. And that's this expansion's real problem: lack of impact. It's nice to have new playthings, but at almost the cost of a whole new game, even the most dedicated devotees can probably do without these toys. As you can guess from its title, Generations deepens and broadens your sims' various stages of life by adding mechanics suited to their age. It begins in childhood, with one of the expansion's most charming and surreal additions: the imaginary friend. This semicreepy stuffed wonder morphs from plush toy into a combination of best friend and personal assistant. Watching your child's purple Martian mutant saunter about with an exaggerated bounce is as charming and silly a sight as any in the series, and you only see him when you are directly controlling your child. Want a snack? Send your pal to grab you one. Want help with making the beds and cleaning the toilet? Ask your invisible friend to help with your chores. Heck, you can even turn him into a controllable sim if you mess around at the chemistry table often enough. You make potions here, one of which will make your virtual Pinocchio a real boy. Well, almost, anyway. You can craft other potions at the table too, such as mood enhancers and the like, though potions aren't exactly new; the Makin' Magic expansion for the original game included a similar mechanic. As you move through the years, you also unlock new features. Children don't just get living plushies: They can play on seesaws and in tree houses or use any of the other playground equipment added to the Buy mode. They can also pull pranks, at home or elsewhere. Your cackling kid may sneak up to his parents' laptop and set it up to scare the next sim that uses it or plant a whoopee cushion on the sofa. The sim that falls victim to the prank is disgusted by the sound, and temporarily suffers from a negative moodlet. If your kid prefers milder forms of fun, you can always dress him or her up as a dinosaur using the new costume chest. Here, as in other ways, Generations encapsulates an important truth of youth: Children dressed as fairy princesses and astronauts are adorable. Teens are more known for angst than adorableness, so perhaps you'd like to prank the school and release frogs from the science lab; it's a pity you only read of the results in in-game text rather than witness the hysterical results. Your teens can also go to prom, but this is an option sadly underutilized. Perhaps your prom was a slow-dancing delight, or perhaps it was a public display of romantic awkwardness. Either way, you can't relive those moments in The Sims 3: Generations. Your teen and his or her date simply disappear into the building, and you get periodic updates in the corner of your screen. Luckily, other elements are more interactive. You can throw bachelor parties now for engaged sims, and if things get wild and crazy, why not pull out a video camera? You activate cameras from your personal inventory and "tape" events from a first-person view. It's actually pretty amusing to step into the shoes of an individual sim in this manner because you suddenly feel like you are actually eavesdropping on your neighbors' conversations rather than having your virtual doppelganger do your dirty work for you. Later, you can watch your home videos on television, though reliving these moments isn't nearly as fun as capturing them in the first place. Perhaps you aren't so much into the partying aspect of The Sims 3. Luckily, there's at least a little something new to mess with for most types of players. Builders and buyers will appreciate spiral staircases and the new wedding arch; family-oriented folks will like how you can reprimand your kids when they're particular naughty; and if you're into woohoo, beware: You now have to worry about your romantic reputation. These changes are all fine in and of themselves, but they don't bring anything significant to the table; they simply broaden existing features. Previous expansions added game-changing mechanics like celebrity fame, puzzle-solving adventures, and interactive careers. Granted, Generations adds a new profession--Day Care--but attending to a roomful of toddlers that need constant changing and socializing isn't as fun as busting ghosts or fighting fires. (Though to be fair, Day Care is not a career, but a profession, which is an important distinction to Sims 3 players.) But Generations mostly stretches out what already existed and offers nothing exciting enough to lure you back to the game if you've moved on from it. Its final impact is that of a "stuff pack" with added social features rather than a true expansion. Generations is in part aimed at the "Sims 3 as sharing experience" crowd, as evidenced by the new social networking integration, which allows you to upload key moments to the Sims 3 website and share them on your Facebook wall. Now, the virtual life you live in The Sims 3 has more bearing on your actual life than ever before. But even voracious Sims lovers might wonder whether $39.99 is too much to ask for a product that feels less like an expansion and more like a collection of gameplay odds and ends. Those odds and ends are agreeable at least, though they aren't all that's new in The Sims 3: Generations. You could run into bugs you've never seen before. You might receive notice that your teen has made a new friend at school: himself. Or your normally endearing child might temporarily morph into a hideous long-armed freak, with her head in the middle of her abdomen. Glitches aside, Generations adds entertaining moments to a franchise that turns routine duties, like taking showers and tossing salads, into compelling delights, but these new moments are too infrequent and unexceptional to justify the high price tag. 2. Install the game. Use the keygen in the /Crack directory on the Data when prompted for a key. 3. Copy over the cracked content from the /Crack directory on the Data to your install directory of the main game.